The History of Jordan refers to the history of the Hashemite Kingdom of Jordan and the background period of the Emirate of Transjordan under British protectorate as well as the general history of the region of Transjordan. There is evidence of human activity in Transjordan as early as the Paleolithic period. The area was settled by nomadic tribes in the Bronze Age, which consolidated in small kingdoms during the Iron Age – such as the Edomites and Ammonites, with partial areas controlled by the Israelites. In the classic period, Transjordan came under Greek and later Roman influence. Under the Romans and the Byzantines, Transjordan was home to the Decapolis in the North, with much of the region being designated as Byzantine Arabia. Classical kingdoms located in the region of Transjordan, such as the Roman-era Nabatean kingdom, which had its capital in Petra, left particularly dramatic ruins popular today with tourists and filmmakers. The history of Transjordan continued with the Muslim empires starting in the 7th century, partial crusader control in the mid-Middle Ages (country of Oultrejordain) and finally, Mamluk Sultanate (Cairo) since 13th century and the Ottoman Empire from the 16th century until World War I. With the Great Arab Revolt in 1916 and the consequent British invasion, the area came under Occupied Enemy Territory Administration in 1917 and with the British mandate of Transjordan in early 1920s, it became the Emirate of Transjordan under the Hashemite Emir. 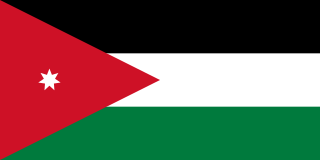 In 1946, independent Hashemite Kingdom of Transjordan was formed and shortly admitted to the United Nations and the Arab League. In 1948, Jordan fought with the newly born state of Israel over lands of former Mandatory Palestine, effectively gaining control of the West Bank and annexing it with its Palestinian population. Jordan lost West Bank in the 1967 War with Israel, and since became the central base of the PLO in its struggle against Israel. The alliance between the PLO and the Jordanians, active during the War of Attrition, came to an end in the bloody Black September in Jordan in 1970, when a civil war between Jordanians and Palestinians (with Syrian Ba'athist support) took thousands of lives. In the aftermath, defeated PLO was forced out of Jordan together with tens of thousands of its fighters and their Palestinian families, relocating to South Lebanon. Evidence of human activity in Jordan dates back to the Paleolithic period. While there is no architectural evidence from this era, archaeologists have found tools, such as flint and basalt hand-axes, knives and scraping implements. In the Neolithic period (8500–4500 BC) three major shifts occurred. First, people became sedentary, living in small villages, and discovering and domesticating new food sources such as cereal grains, peas and lentils, as well as goats. The human population increased to tens of thousands. Second, this shift in settlement patterns appears to have been catalyzed by a marked change in climate. The eastern desert, in particular, grew warmer and drier, eventually to the point where it became uninhabitable for most of the year. This watershed climate change is believed to have occurred between 6500 and 5500 BC. Third, beginning sometime between 5500 and 4500 BC, the inhabitants began to make pottery from clay rather than plaster. Pottery-making technologies were probably introduced to the area by craftsmen from Mesopotamia. The largest Neolithic site in Jordan is at Ein Ghazal in Amman. The many buildings were divided into three distinct districts. Houses were rectangular and had several rooms, some with plastered floors. Archaeologists have unearthed skulls covered with plaster and with bitumen in the eye sockets at sites throughout Jordan, Israel, the Palestinian Territories and Syria. A statue discovered at Ein Ghazal is thought to be 8,000 years old. Just over one meter high, it depicts a woman with huge eyes, skinny arms, knobby knees and a detailed rendering of her toes. During the Chalcolithic period (4500–3200 BC), copper began to be smelted and used to make axes, arrowheads and hooks. The cultivation of barley, dates, olives and lentils, and the domestication of sheep and goats, rather than hunting, predominated. The lifestyle in the desert was probably very similar to that of modern Bedouins. Tuleitat Ghassul is a large Chalcolithic era village located in the Jordan Valley. The walls of its houses were made of sun-dried mud bricks; its roofs of wood, reeds and mud. Some had stone foundations, and many had large central courtyards. The walls are often painted with bright images of masked men, stars, and geometric motifs, which may have been connected to religious beliefs. Many of the villages built during the Early Bronze Age (3200–1950 BC) included simple water infrastructures, as well as defensive fortifications probably designed to protect against raids by neighboring nomadic tribes. At Bab al-Dhra in Wadi `Araba, archaeologists discovered more than 20,000 shaft tombs with multiple chambers as well as houses of mud-brick containing human bones, pots, jewelry and weapons. Hundreds of dolmens scattered throughout the mountains have been dated to the late Chalcolithic and Early Bronze Ages. Although writing was developed before 3000 BC in Egypt and Mesopotamia, it was generally not used in Jordan, Canaan and Syria until some thousand years later, even though archeological evidence indicates that the Jordanians were trading with Egypt and Mesopotamia. Between 2300 and 1950 BC, many of the large, fortified hilltop towns were abandoned in favor of either small, unfortified villages or a pastoral lifestyle. There is no consensus on what caused this shift, though it is thought to have been a combination of climatic and political changes that brought an end to the city-state network. During the Middle Bronze Age (1950–1550 BC), migration across the Middle East increased. Trading continued to develop between Egypt, Syria, Arabia, Canaan and Jordan, resulting in the spread of technology and other hallmarks of civilization. Bronze, forged from copper and tin, enabled the production of more durable axes, knives, and other tools and weapons. Large, distinct communities seem to have arisen in northern and central Jordan, while the south was populated by a nomadic, Bedouin-type of people known as the Shasu. New fortifications appeared at sites like Amman's Citadel, Irbid, and Tabaqat Fahl (or Pella). Towns were surrounded by ramparts made of earth embankments, and the slopes were covered in hard plaster, making the climb slippery and difficult. Pella was enclosed by massive walls and watch towers. Archaeologists usually date the end of the Middle Bronze Age to about 1550 BC, when the Hyksos were driven out of Egypt during the 17th and 18th Dynasties. A number of Middle Bronze Age towns in Canaan and Jordan were destroyed during this time. The most prominent Iron Age kingdoms in Jordan were Ammon, Moab, and Edom. The Ammonites had their capital in Rabbath Ammon. The Moabites settled Kerak Governorate with their capital at Kir of Moab (Kerak), and the kingdom of Edom settled in southern Jordan and southern Israel, and their capital was in Bozrah in Tafilah Governorate. The kingdom of Ammon maintained its independence from the Assyrian empire, unlike all other kingdoms in the region which were conquered. In about 840 BC, Meshe, the King of the Moabites, revolted against the "House of David." Moab lay east of the Dead Sea, about 70 kilometers south of Amman. This battle is recorded in the Bible's 2 Kings chapter 3. The Bible's story is corroborated by the Mesha Stele, the Moabite Stone that was found in the Jordanian town of Dhiban in 1868. This find indicated that the Moabites worked with inscriptions on bluish basalt stone. Petra, the capital of the Nabatean kingdom, is where the Nabatean alphabets, the current Arabic language alphabets, were invented. Later antiquity saw the rise of the Nabatean kingdom (Arabic: الأنباط‎ Al-Anbat) with its capital at Petra, which was a border, client state of the Roman Empire absorbed into the Empire in 106 CE, and the ancient city of Saltus. During the Greco-Roman period of influence, a number of semi-independent city-states also developed in Jordan, grouped as a Decapolis including: Gerasa (Jerash), Philadelphia (Amman), Raphana (Abila), Dion (Capitolias), Gadara (Umm Qays), and Pella (Irbid). Under the Umayyad's successors, the Abbasids (750–1258), Jordan was neglected and began to languish due to the geo-political shift that occurred when the Abassids moved their capital from Damascus to Kufa and later to Baghdad. After the decline of the Abbasids, parts of Jordan were ruled by various powers and empires including the Crusaders, the Ayyubids, the Mamlukes as well as the Ottomans, who captured major parts of the Arab World around 1517. In 1516, Ottoman forces invaded the Levant and gained control. Agricultural villages in Jordan witnessed a period of relative prosperity in the 16th century, but were later abandoned. For the next centuries, Ottoman rule in the region, at times, was virtually absent and reduced to annual tax collection visits. This led to a short-lived occupation by the Wahhabi forces (1803–1812), an ultraorthodox Islamic movement that emerged in Najd in Saudi Arabia. Ibrahim Pasha, son of the governor of the Egypt Eyalet under the request of the Ottoman sultan, rooted out Wahhabi power in a successful campaign between 1811 and 1818. In 1833 Ibrahim Pasha turned on the Ottomans and established his rule, whose oppressive policies led to the unsuccessful Peasants' revolt in Palestine in 1834. Transjordanian cities of Al-Salt and Al-Karak were destroyed by Ibrahim Pasha's forces for harboring a fled Palestinian revolt leader. Egyptian rule was later forcibly ended after western intervention, the Ottoman rule was restored. Russian persecution of Sunni Muslim Circassians in Circassia, forced their immigration into the region in 1867, where they today form a small part of the country's ethnic fabric. Oppression and neglect for the people of the region forced the population to decline, the only people left were nomadic Bedouins. Urban settlements with small populations included; Al-Salt, Irbid, Jerash and Al-Karak. What added to the under-development of the urban life in Jordan was the fact that the settlements were raided by the Bedouins as a source of living, the urbanites had to pay them to stay safe. Jordan's location lies in a route that is taken by Muslims going on pilgrimage to Mecca; this helped the population economically when the Ottomans constructed the Hejaz Railway linking Mecca and Istanbul in 1910. Ottoman oppression provoked the region's Bedouin tribes, such as the Adwan, Bani Hassan, Bani Sakhr and the Howeitat, to revolt, Most notable revolts were the Shoubak revolt and the Karak revolt, they were only suppressed with great difficulty. First election in Transjordan's history on 2 April 1929. After four centuries of stagnant Ottoman rule (1516–1918), Turkish control over Transjordan came to an end during World War I when the Hashemite Army of the Great Arab Revolt, took over and secured present-day Jordan with the help and support of the region's local Bedouin tribes, Circassians and Christians. The revolt was launched by the Hashemites and led by Sharif Hussein of Mecca against the Ottoman Empire. This came due to the emergence of Arab nationalism and resentment towards the Ottoman authorities. The revolt was supported by the Allies of World War I including Britain and France. With the break-up of the Ottoman Empire at the end of World War I, the League of Nations and the occupying powers, Britain and France, redrew the borders of the Middle East. Their decisions, most notably the Sykes–Picot Agreement, led to the establishment of the French Mandate for Syria and British Mandate for Palestine. The latter included the territory of Transjordan, which had been allocated to Abdullah I of Jordan approximately a year prior to the finalization of the Mandate document (the Mandate officially introduced in 1923). One reason was that the British government had at that point to find a role for Abdullah, after his brother Faisal had lost his control in Syria and been given the role of the king of Iraq. The British consequently made Abdullah emir of the newly created Transjordan. At first, Abdullah was displeased with the territory given to him, and hoped it was only a temporary allocation, to be replaced by Syria or Palestine. The Permanent Court of International Justice and an International Court of Arbitration established by the Council of the League of Nations handed down rulings in 1925 which determined that Palestine and Transjordan were newly created successor states of the Ottoman Empire as defined by international law. The most serious threats to Emir Abdullah's position in Transjordan were repeated Wahhabi incursions from Najd into southern parts of his territory. The emir was powerless to repel those raids by himself, thus the British maintained a military base, with a small air force, at Marka, close to Amman. The British military force was the primary obstacle against the Wahhabis between 1922–1924, and was also utilized to help emir Abdullah with the suppression of local rebellions, first at Kura and later by Sultan Adwan, in 1921 and 1923 respectively. In 1928, Britain officially provided King Abdullah with full autonomy, though the British RAF continued to provide security to the Hashemite Emirate. The Emirate of Transjordan had a population of 200,000 in 1920, 225,000 in 1922 and 400,000 (as Kingdom) in 1948. Almost half of the population in 1922 (around 103,000) was nomadic. On 17 January 1946, Ernest Bevin the British Foreign Secretary, announced in a speech at the General Assembly of the United Nations, that the British Government intended to take steps in the near future to establish Transjordan as a fully independent and sovereign state. The Treaty of London was signed by the British Government and the Emir of Transjordan on 22 March 1946 as a mechanism to recognise the full independence of Transjordan upon ratification by both countries parliaments. Transjordan's impending independence was recognized on April 18, 1946 by the League of Nations during the last meeting of that organization. On 25 May 1946 the Transjordan became the "Hashemite Kingdom of Transjordan" when the ruling 'Amir' was re-designated as 'King' by the parliament of Transjordan on the day it ratified the Treaty of London. 25 May is still celebrated as independence day in Jordan although legally the mandate for Transjordan ended on 17 June 1946 when, in accordance with the Treaty of London, the ratifications were exchanged in Amman and Transjordan gained full independence. When King Abdullah applied for membership in the newly formed United Nations, his request was vetoed by the Soviet Union, citing that the nation was not "fully independent" of British control. This resulted in another treaty in March 1948 with Britain in which all restrictions on sovereignty were removed. Despite this, Jordan was not a full member of the United Nations until December 14, 1955. Suleiman Mousa (1919–2008), pioneer in the modern history of Jordan and Arab Revolt. In April 1949, after the country gained control of the West Bank, the country's official name became the "Hashemite Kingdom of Jordan". Transjordan was one of the Arab states opposed to the second partition of Palestine and creation of Israel in May 1948. It participated in the war between the Arab states and the newly founded State of Israel. Thousands of Palestinians fled the Arab-Israeli fighting to the West Bank and Jordan. The Armistice Agreements of 3 April 1949 left Jordan in control of the West Bank and provided that the armistice demarcation lines were without prejudice to future territorial settlements or boundary lines. The United Nations General Assembly adopted a plan for the future government of Palestine which called for termination of the Mandate not later than 1 August 1948. The works of Benny Morris, Avi Shlaim, Ilan Pappe, Mary Wilson, Eugene Rogan, and other historians outline a modus vivendi agreement between Abdullah and the Yishuv. Those works are taught in most Israeli university courses on the history, political science, and sociology of the region. Archival materials reveal that the parties had negotiated the non-belligerent partition of Palestine between themselves, and that initially they had agreed to abide by the terms of the UN resolution. John Baggot Glubb, the commander of the Arab Legion, wrote that British Foreign Secretary Bevin had given the green light for the Arab Legion to occupy the territory allocated to the Arab state. The Prime Minister of Transjordan explained that Abdullah had received hundreds of petitions from Palestinian notables requesting protection upon the withdrawal of the British forces. Eugene Rogan says that those petitions, from nearly every town and village in Palestine, are preserved in The Hashemite Documents: The Papers of Abdullah bin al-Husayn, volume V: Palestine 1948 (Amman 1995). In explaining to the Security Council why Transjordan's armed forces had entered Palestine Abdullah said: "we were compelled to enter Palestine to protect unarmed Arabs against massacres similar to those of Deir Yassin." In 1978, the U.S. State Department published a memorandum of conversation between Mr. Stuart W. Rockwell of the Office of African and Near Eastern Affairs and Abdel Monem Rifai, a Counselor of the Jordan Legation, on 5 June 1950. Mr. Rifai asked when the United States was going to recognize the union of Arab Palestine and Jordan. Mr. Rockwell explained the Department's position, stating that it was not the custom of the United States to issue formal statements of recognition every time a foreign country changed its territorial area. The union of Arab Palestine and Jordan had been brought about as a result of the will of the people and the US accepted the fact that Jordanian sovereignty had been extended to the new area. Mr. Rifai said he had not realized this and that he was very pleased to learn that the US did in fact recognize the union. On 24 April 1950, Jordan formally annexed the West Bank (including East Jerusalem) declaring "complete unity between the two sides of the Jordan and their union in one state...at whose head reigns King Abdullah Ibn al Hussain". All West Bank residents were granted Jordanian citizenship. The December 1948 Jericho Conference, a meeting of prominent Palestinian leaders and King Abdullah, voted in favor of annexation into what was then Transjordan. Jordan’s annexation was regarded as illegal and void by the Arab League and others. It was recognized by Britain, Iraq and Pakistan. The annexation of the West Bank more than doubled the population of Jordan. Both Irbid and Zarqa more than doubled their population from less than 10,000 each to more than, respectively, 23,000 and 28,000. King Abdullah's eldest son, Talal of Jordan, was proclaimed king in 1951, but he was declared mentally unfit to rule and deposed in 1952. His son, Hussein Ibn Talal, became king on his eighteenth birthday, in 1953. The 1950s have been labelled as a time of "Jordan's Experiment with Liberalism". Freedom of speech, freedom of the press, and freedom of association were guaranteed in the newly written constitution as with the already firmly established freedom of religion doctrine. Jordan had one of the freest and most liberal societies in the Middle East and in the greater Arab world during the 1950s and early 1960s. Jordan ended its special defense treaty relationship with the United Kingdom and British troops completed their withdrawal in 1957. In February 1958, following announcement of the merger of Syria and Egypt into the United Arab Republic, Iraq and Jordan announced the Arab Federation of Iraq and Jordan, also known as the Arab Union. The Union was dissolved in August 1958. Image showing the approximate land exchanged between Jordan (gaining green) and Saudi Arabia (gaining red). In 1965 Jordan and Saudi Arabia concluded a bilateral agreement that realigned the border. The realignment resulted in some exchange of territory, and Jordan's coastline on the Gulf of Aqaba was lengthened by about eighteen kilometers. The new boundary enabled Jordan to expand its port facilities and established a zone in which the two parties agreed to share petroleum revenues equally if oil were discovered. The agreement also protected the pasturage and watering rights of nomadic tribes inside the exchanged territories. Jordan signed a mutual defense pact in May 1967 with Egypt, and it participated, along with Syria, Egypt, and Iraq in the Six-Day War of June 1967 against Israel. During the war, Israel took control of East Jerusalem and West Bank, leading to another major influx of Palestinian refugees into Jordan. Its Palestinian refugee population—700,000 in 1966—grew by another 300,000 from the West Bank. The period following the 1967 war saw an upsurge in the power and importance of Palestinian militants (fedayeen) in Jordan. Other Arab governments attempted to work out a peaceful solution, but by September 1970, known as the Black September in Jordan, continuing fedayeen actions in Jordan — including the destruction of three international airliners hijacked and held in the desert east of Amman — prompted the Jordanian government to take action. In the ensuing heavy fighting, a Syrian tank force took up positions in northern Jordan to support the fedayeen but was forced to retreat. By September 22, Arab foreign ministers meeting at Cairo had arranged a cease-fire beginning the following day. Sporadic violence continued, however, until Jordanian forces won a decisive victory over the fedayeen in July 1971, expelling them from the country. An attempted military coup was thwarted in 1972. No fighting occurred along the 1967 cease-fire line during the Yom Kippur War in 1973, but Jordan sent a brigade to Syria to fight Israeli units on Syrian territory. In 1974, King Hussein recognised the PLO as the sole legitimate representative of the Palestinian people. However, in 1986, Hussein severed political links with the PLO and ordered its main offices to be closed. In 1988, Jordan renounced all claims to the West Bank but retained an administrative role pending a final settlement. Hussein also publicly backed the Palestinian uprising, or First Intifada, against Israeli rule. Jordan witnessed some of the most severe protests and social upheavals in its history during the 1980s, protests in Jordanian universities especially Yarmouk University and urban areas protested inflation and lack of political freedom. A massive upheaval occurred in the southern city of Ma'an. There was rioting in several cities over price increases in 1989. The same year saw the first general election since 1967. It was contested only by independent candidates because of the ban on political parties in 1963. Martial law was lifted and a period of rapid political liberalization began. Parliament was restored and some thirty political parties, including the Islamic Action Front, were created. Jordan did not participate directly in the Gulf War of 1990–1991, but it broke with the Arab majority and supported the Iraqi position of Saddam Hussein. This position led to the temporary repeal of U.S. aid to Jordan. As a result, Jordan came under severe economic and diplomatic strain. After the Iraqi defeat in 1991, Jordan, along with Syria, Lebanon, and Palestinian representatives, agreed to participate in direct peace negotiations with Israel sponsored by the U.S. and Russia. Eventually, Jordan negotiated an end to hostilities with Israel and signed a declaration to that effect on July 25, 1994; the Israel-Jordan Peace Treaty was concluded on October 26, 1994, ending 46-year official state of war. Food price riots occurred in 1996, after subsidies were removed under an economic plan supervised by the International Monetary Fund. By the late 1990s, Jordan's unemployment rate was almost 25%, while nearly 50% of those who were employed were on the government payroll. The 1997 parliamentary elections were boycotted by several parties, associations and leading figures. In 1998, King Hussein was treated for lymphatic cancer in the United States. After six months of treatment he returned home to a rousing welcome in January 1999. Soon after, however, he had to fly back to the US for further treatment. King Hussein died in February 1999. More than 50 heads of state attended his funeral. His eldest son Crown Prince Abdullah succeeded to the throne. Economic liberalization policies under King Abdullah II have helped to create one of the freest economies in the Middle East. In March 2001, King Abdullah and presidents Bashar al-Assad of Syria and Hosni Mubarak of Egypt inaugurated a $300m (£207m) electricity line linking the grids of the three countries. In September 2002, Jordan and Israel agreed on a plan to pipe water from the Red Sea to the shrinking Dead Sea. The project, costing $800m, is the two nations' biggest joint venture to date. King Abdullah and Syrian President Bashar al-Assad launched the Wahdah Dam project at a ceremony on the Yarmuk River in February 2004. Jordan has sought to remain at peace with all of its neighbors. In September 2000, a military court sentenced six men to death for plotting attacks against Israeli and US targets. Following the outbreak of Israeli-Palestinian fighting in September 2000, Amman withdrew its ambassador to Israel for four years. In 2003, Jordan's Central Bank retracted an earlier decision to freeze accounts belonging to leaders of Hamas. When senior US diplomat Laurence Foley was gunned down outside his home in Amman in October 2002, in the first assassination of a Western diplomat in Jordan, scores of political activists were rounded up. Eight militants were later found guilty and executed in 2004. King Abdullah did, however, criticise the United States and Israel over the conflict in Lebanon in 2006. Jordan's gradual institution of political and civil liberty has continued, but the slow pace of reform has led to increasing discontent. Following the death of a youth in custody, riots erupted in the southern town of Maan in January 2002, the worst public disturbances in more than three years. The first parliamentary elections under King Abdullah II were held in June 2003. Independent candidates loyal to the king won two-thirds of the seats. A new cabinet was appointed in October 2003 following the resignation of Prime Minister Ali Abu al-Ragheb. Faisal al-Fayez was appointed prime minister. The king also appointed three female ministers. However, in April 2005, amid reports of the king's dissatisfaction with the slow pace of reforms, the government resigned and a new cabinet was sworn in, led by Prime Minister Adnan Badran. The first local elections since 1999 were held in July 2007. The main opposition party, the Islamist Action Front, withdrew after accusing the government of vote-rigging. The parliamentary elections of November 2007 strengthened the position of tribal leaders and other pro-government candidates. Support for the opposition Islamic Action Front declined. Political moderate Nader Dahabi was appointed prime minister. In November 2009, the King once more dissolved parliament halfway through its four-year term. The following month, he appointed a new premier to push through economic reform. A new electoral law was introduced May 2010, but pro-reform campaigners said it did little to make the system more representational. The parliamentary elections of November 2010 were boycotted by the opposition Islamic Action Front. Riots broke out after it was announced that pro-government candidates had won a sweeping victory. On 14 January, the Jordanian protests began in Jordan's capital Amman, and at Ma'an, Al Karak, Salt and Irbid, and other cities. The following month, King Abdullah appointed a new prime minister, former army general Marouf Bakhit, and charged him with quelling the protests whilst carrying out political reforms. The street protests continued through the summer, albeit on a smaller scale, prompting the King to replace Bakhit with Awn al-Khasawneh, a judge at the International Court of Justice (October 2011). However, Prime Minister Awn al-Khasawneh resigned abruptly after just six months having been unable to satisfy either the demands for reform or allay establishment fears of empowering the Islamist opposition. King Abdullah appointed former prime minister Fayez al-Tarawneh to succeed him. In October 2012, King Abdullah called for early parliamentary elections, to be held at some time in 2013. The Islamic Action Front, continued in its calls for broader political representation and a more democratic parliament. The King appointed Abdullah Ensour, a former minister and vocal advocate of democratic reform, as prime minister. Mass demonstrations took place in Amman (November 2012) against the lifting of fuel subsidies. Public calls for the end of the monarchy were heard. Clashes between protesters and supporters of the king followed. The government reversed the fuel price rise following the protest. Al Jazeera stated that protests are expected to continue for several weeks because of increasing food prices. With the rapid expansion of the Islamic State of Iraq and the Levant into northern and eastern Iraq in summer of 2014, Jordan became threatened by the radical Jihadist organization, boosting troops on the Iraqi and Syrian borders. Harding, G. Lankester. 1959. The Antiquities of Jordan. Lutterworth Press, London. 2nd impression, 1960. Translated to Arabic by Suleiman Al-Musa as: Athar Al-Urdon, 2nd. Edition, Amman: Ministry of Tourism, 1971. ^ M. W. Daly, Carl F. Petry (1998). The Cambridge history of Egypt. Cambridge University Press. p. 498. ISBN 9780521471374. ^ a b Eugene Rogan, Tariq Tell (1994). Village, Steppe and State: The Social Origins of Modern Jordan. British Academic Press. pp. 37, 47. ISBN 9781850438298. Retrieved 2016-06-08. ^ a b Beverley Milton-Edwards, Peter Hinchcliffe (2009-06-05). Jordan: A Hashemite Legacy. Routledge. p. 14. ISBN 9781134105465. Retrieved 2016-06-07. ^ a b Perdew Laura (2014-11-01). Understanding Jordan Today. Mitchell Lane Publishers, Inc. p. 17. ISBN 9781612286778. Retrieved 2016-04-09. ^ Pete W. Moore (2004-10-14). Doing Business in the Middle East: Politics and Economic Crisis in Jordan and Kuwait. Cambridge University Press. p. 58. ISBN 9781139456357. Retrieved 2016-06-04. ^ Raphael Patai (2015-12-08). Kingdom of Jordan. Princeton University Press. pp. 23, 32. ISBN 9781400877997. Retrieved 2016-06-08. ^ E. George H. Joffé (2002). Jordan in Transition. C. Hurst & Co. Publishers. pp. 212, 308. ISBN 9781850654889. Retrieved 15 October 2015. ^ Lawrence, T. E. (1922). Seven Pillars of Wisdom. United Kingdom. ^ Ian J. Bickerton. "Transjordan, the Hāshimite Kingdom, and the Palestine war". Encyclopædia Britannica. ^ Foreign relations of the United States, 1950. The Near East, South Asia, and Africa, Volume V (1950), page 921. ^ "See Member States of the United Nations". ^ Eyāl Benveniśtî. The international law of occupation, Princeton University Press, 2004. pg. 108. ISBN 0-691-12130-3. "This purported annexation was, however, widely regarded as illegal and void, by the Arab League and others, and was recognized only by Britain, Iraq, and Pakistan." ^ Yoram Dinstein; Mala Tabory (1 September 1994). Israel Yearbook on Human Rights: 1993. Martinus Nijhoff Publishers. p. 41. ISBN 978-0-7923-2581-9. Retrieved 21 December 2010. Israel considers Jordan’s annexation of the West Bank, recognised only by Great Britain and Pakistan, to have been illegal. ^ "Jordan Formally Annexes the West Bank" by Cavendish, Richard - History Today, Vol. 50, Issue 4, April 2000 | Online Research Library: Questia Reader". ^ "Jordan profile". BBC News. 2018-06-05. ^ a b Andoni, Lamis (2011-01-16). "To the tyrants of the Arab world ..." Al Jazeera. Archived from the original on 2011-01-18. Retrieved 2011-01-19. The Emirate of Transjordan, officially known as the Amirate of Trans-Jordan, was a British protectorate established in April 1921. The Hashemites are the ruling royal family of Jordan. The House was also the royal family of Syria (1920), Hejaz (1916–1925) and Iraq (1921–1958). The family belongs to the Dhawu Awn, one of the branches of the Hasanid Sharifs of Mecca – also referred to as Hashemites – who ruled Mecca continuously from the 10th century until its conquest by the House of Saud in 1924. Their eponymous ancestor is traditionally considered to be Hashim ibn Abd Manaf, great-grandfather of the Islamic prophet, Muhammad. Abdullah I bin Al-Hussein was the ruler of Jordan and its predecessor state, Transjordan, from 1921 until his assassination in 1951. He was Emir of Transjordan from 21 April 1921 to 25 May 1946 under a British mandate, and was king of an independent nation from 25 May 1946 until his assassination. According to Abdullah, he was a 38th-generation direct descendant of Muhammad as he belongs to the Hashemite family. Hussein ibn Ali al-Hashimi was a Hashemite Arab leader who was the Sharif and Emir of Mecca from 1908 and, after proclaiming the Arab Revolt against the Ottoman Empire, King of the Hejaz from 1916 to 1924. At the end of his reign he also briefly laid claim to the office of Caliph. He was said to be a 37th-generation direct descendant of Muhammad as he belongs to the Hashemite family. Talal bin Abdullah was King of Jordan from the assassination of his father, King Abdullah I, on 20 July 1951, until he was forced to abdicate on 11 August 1952. According to Talal, he was a 39th-generation direct descendant of Muhammad as he belongs to the Hashemite family—who have ruled Jordan since 1921. The Jordanian annexation of the West Bank was the occupation and consequent annexation of the West Bank by Jordan in the aftermath of the 1948 Arab–Israeli War. During the war, Jordan's Arab Legion conquered the Old City of Jerusalem and took control of territory on the western side of the Jordan River, including the cities of Jericho, Bethlehem, Hebron and Nablus. At the end of hostilities, Jordan was in complete control of the West Bank. Awni Abd al-Hadi, was a Palestinian political figure. He was educated in Beirut, Istanbul, and at the Sorbonne University in Paris. His wife was Tarab Abd al-Hadi, a Palestinian activist and feminist. Jordan, officially the Hashemite Kingdom of Jordan, is an Arab country in Western Asia, on the East Bank of the Jordan River. Jordan is bordered by Saudi Arabia to the south, Iraq to the north-east, Syria to the north and Israel and Palestine to the west. The Dead Sea is located along its western borders and the country has a small coastline to the Red Sea in its extreme south-west, but is otherwise landlocked. Jordan is strategically located at the crossroads of Asia, Africa and Europe. The capital, Amman, is Jordan's most populous city as well as the country's economic, political and cultural centre. Relations between neighbours Jordan and Syria have ancient roots as Jordan was historically the southern part of Syria. The two states were created after the First World War from former Ottoman dominions by way of a secret bilateral agreement between Britain and France. Ali Rida Pasha al-Rikabi, was the First Prime Minister in modern Syria, also Prime Minister of Jordan. Israel–Jordan relations refers to the diplomatic, economic and cultural relations between Israel and Jordan. The two countries have had official diplomatic relations since the 1994 signing of the Israel–Jordan peace treaty. Recently, relations have been strained due to the conflict over the Al-Aqsa mosque. The Jericho Conference was held in December 1948 to decide the future of the portion of Palestine that was held by Jordan at the end of the 1948 Arab–Israeli War, led by Sheikh Muhammad Ali Ja'abari. Pro-Jordanian personalities called for the annexation of the West Bank, including East Jerusalem, to Jordan. This unification was later known as the "Unification of the Two Banks"
Abdullah Rimawi was the head of the Ba'ath Party in Jordan in the 1950s. He served as Foreign Affairs Minister in Suleiman Nabulsi's government in 1957. A staunch pan-Arabist, Rimawi became one of the most vocal opponents of the Hashemite ruling family in Jordan and favored union with Syria. He fled Jordan in 1957 as the result of a crisis between the leftist government he was a part of and the royal family. He based himself in the United Arab Republic where he drew closer to UAR President Gamal Abdel Nasser provoking his expulsion from the Ba'ath Party—which was at odds with Nasser—in 1959. Soon after he founded a splinter party called the Arab Socialist Revolutionary Ba'ath Party. During his exile, he allegedly made a number of attempts to attack or undermine the Jordanian monarchy. The All-Palestine Government was established by the Arab League on 22 September 1948 during the 1948 Arab–Israeli War to govern the Egyptian-controlled enclave in Gaza. It was soon recognized by all Arab League members except Transjordan. Though jurisdiction of the Government was declared to cover the whole of the former Mandatory Palestine, its effective jurisdiction was limited to the Gaza Strip. 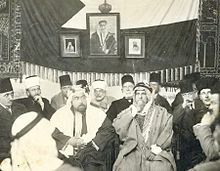 The Prime Minister of the Gaza-seated administration was Ahmed Hilmi Pasha, and the President was Hajj Amin al-Husseini, former chairman of the Arab Higher Committee. The Arab Liberation Army, also translated as Arab Salvation Army, was an army of volunteers from Arab countries led by Fawzi al-Qawuqji. It fought on the Arab side in the 1948 Palestine war and was set up by the Arab League as a counter to the Arab High Committee's Holy War Army, though in fact the League and Arab governments prevented thousands from joining either force. Ali Abu Nuwar was a Jordanian army officer, serving as chief of staff in May 1956 – April 1957. He participated in the 1948 Arab–Israeli War as an artillery officer in the Jordanian army's predecessor, the Arab Legion, but his vocal opposition to British influence in Jordan led to his virtual exile to Paris as military attaché in 1952. There, he forged close ties with Jordanian crown prince Hussein, who promoted Abu Nuwar after his accession to the throne.